Are you looking to reduce stress and anxiety or developing greater personal awareness? If so, you may be interested in practicing mindfulness mediation. The focus of mindfulness is to be aware of the present moment, free from judgment and overthinking. Mastering mindfulness can take practice, but once you start, you may begin to notice benefits immediately. 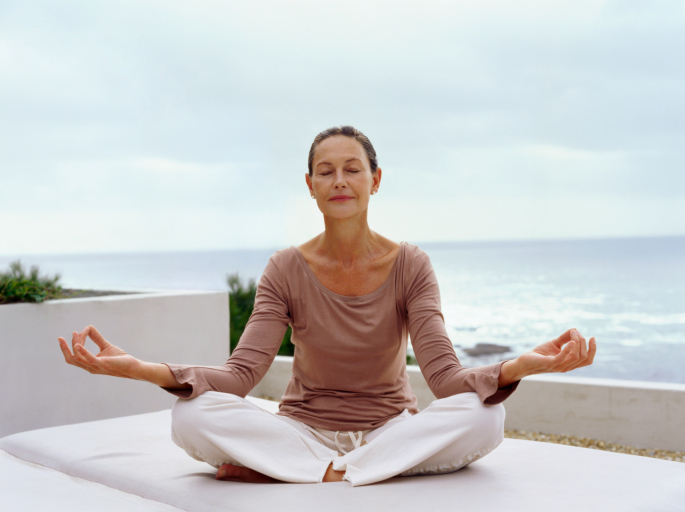 Mindfulness meditation has ancient roots and has long been touted for well-being. Mindfulness can help alleviate negative emotions such as stress, anxiety and sadness, which can result in better moods and less negative self-talk. Other benefits can include increased focus and mental energy from being “freed” from compulsive thoughts and worry. Feeling stressed can have a negative impact on your health. Stress produces a hormone called cortisol which can be detrimental over time and in large quantities. Cortisol can raise blood pressure and glucose levels, slow your metabolism, decrease immune function, and may contribute to chronic diseases such as heart disease and hypertension. Practicing mindfulness meditation as a form of stress relief may help lower blood pressure, improve sleep quality, reduce fatigue, and improve weight management. Plan about 10 minutes of time to start. There is no standard amount of time required to practice. Nevertheless, the longer you’re able to meditate, generally the greater the results. Add time as you begin to perfect your practice. Practice in a quiet place where you’ll be comfortable simply sitting relaxed with your back straight. Calm your breathing. Proper breathing is called “belly breathing.” Practicing this alone can help with stress; coupled with mediation, it can have greater results. Most people breathe from their chest, resulting in insufficient oxygen intake. You must breathe down to your diaphragm in order to belly breathe. You should feel your abdomen expand as you inhale and contract as you exhale. Develop a mantra. Think of a word, phrase, picture or sensation on which you would like to concentrate. As you continue to belly breathe, repeat your mantra in your head. You will find your mind wander to different thoughts and ideas. Embrace these thoughts and the sensations they produce. You may find it tough to develop a mantra when beginning to meditate. Try some of these suggestions for inspiration: let go, patience, I am well, happiness or hope. Remember: mantras don’t necessarily have to be words. Mantras can also be visualizations such as landscapes and activities. They can also be sensations including feelings of warmth, relaxation, and well-being. As you repeat your mantra, you will begin to notice outside thoughts and feelings. Consider the waves of sensations and feelings without judging them or becoming preoccupied by the thoughts. If you find yourself getting off track, refocus your breathing and your mantra. When you’re ready to end your meditation, bring yourself back to the present by focusing on just your breath for several minutes. Tip: As you begin to expand your practice, you may also notice yourself becoming mindful outside of your meditation sessions. To further your mindfulness, play close attention to detail in all situations. If you’re interested in apps to help get started with meditation check out Stop, Breathe & Think or Calm Relaxation. To really understand and progress in your mindfulness meditation there is a free, online, self-paced course worth reviewing. Find it here: Palouse Mindfulness training course. The University of California, Los Angeles (UCLA) has 8 free guided meditations you can play through the website or download to carry with you. Guided meditations can be helpful as they direct you with a specific intent or goal to the meditation. Finally, if mindfulness doesn’t seem like something for you, read this article from the Mayo Clinic to learn about other forms of meditation.